ballcock had the most liked content! Have you checked the chassis to make sure it's square? Check the rear axle is parallel to the chassis with a straight edge along the wheel rims. Has it got a lift kit as this will move the front axle to one side if not using an adjustable panhard rod? I replaced the lock on mine after some scum nicked keys from my lock up, I was able to get a pair of locks with matching keys from some one on Ebay. If you are buying a new lock it might be worth considering buying a set of locks with matching keys to use on other things on the truck save having to have multiple keys for various locks. As I say a can of worms, I have my opinion and you are entitled to yours. This is a different can of worms. The fan only needs to run if the radiator is not doing its job. That is how the viscous unit works, so the temp control should be on the return or low level on the radiator. a better system would be a two stage temp control with either two fans or high and low speeds. Let the fight begin. The term used is normally "crabbing" when the rear wheels do not follow the line of the front. If your trailing arm is bent it will cause this as it pulls the rear axle out of alignment with chassis. a replacement will hopefully correct it, but it would be worth checking the chassis for twist. easiest way to this would be to measure diagonally from four points on the chassis extremities and ensure they are equal. I believe there is a post on the forum describing this check somewhere. No, but newer licence holders are limited to the number of seats. As an old git I can still drive a twelve seater, as long as it's not for hire or reward. My 110 is a daily driver, I find it perfectly adequate in modern driving conditions. comfortable enough with reasonable fuel consumption. 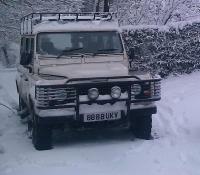 My Disco 1 V8 on the other hand is running on heavy duty springs feels every bump and drinks like a fish. I thought the pump shaft had a woodruff key to align it on the shaft but having just checked a spare pump I have, there is a key slot on the shaft but not on the pulley adaptor so theoretically it would be possible to do as you suggest. Personally for the effort required and the risk of getting it wrong I would pull the case cover and do it properly. The extra effort to remove the pump to fit the boost ring whilst the timing is being sorted is minimal. Just realised 300 tdi mines a 200tdi. Having stripped the cartridge out. i decided to buy a new standard unit. Ordered Thursday, arrived Friday, fitted Sunday less than £100. All up and running nicely. All that bling and none of it on show. This is why I try to get a part number first. I had tried a 1/2" AF but it was as loose as a 13mm , I then tried an old 1/2" AF ring spanner which fitted perfectly I snapped one bolt undid 2 but the last has rounded off so I shall cut the head off as I only want the cartridge. 1/2" AF should be 12.7mm but the tolerances on some are just too much. Will take more care dismantling the Defender one. Still haven't decided whether to get a new hybrid unit. Unfortunately it needs replacing, although I have a turbo off a Discovery 200 TDi it's the wrong orientation. If having to strip two apart to make a serviceable unit. I just wondered if it would be more beneficial to bite the bullet and buy a new cartridge. As a side question what size are the bolts holding the cartridge to the exhaust side as they seem to be a little shy of 13mm but a bit bigger than 12mm? Reviving an old thread as my turbo has just thrown it's toys out, what was the consensus on these hybrid turbos, are they worth fitting or no extra benefit? Try the gauze off a stainless steel sieve.